The kids and I are going to Branson, MO with my mom this week for a mini Spring Break trip. That means the hubby is going to be all alone. Don't worry, I stocked the deep freeze with plenty of his favorite Totino's frozen pizzas and the pantry is stocked with Ramen noodles. I'm positive he can manage on his own. Also, he's got really big muscles and we have a huge Pit Bull that will be staying here for his protection while I am gone so don't even think of breaking in to steal his cookies! Last night I told him I wanted to make him some Deelicious Sweets before I left so he would have a happy belly while I was away. He requested my Best, Big, Fat, Chewy Chocolate Chip Cookies. Long title, I know. 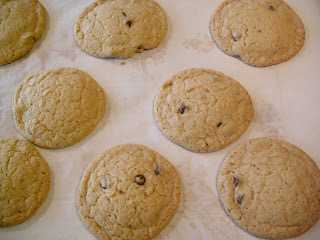 But they are the Best, Big, Fat, Chewy Chocolate Chip Cookies! This was a very (see how I italicized, that means it was extreme) popular Deelicious Sweets request and I am constantly asked for the recipe. However, I have only shared it with a select few. Now, I'm ready to share it with the world. You know something else? I found this recipe on Allrecipes! So, technically, it's not even my recipe! Ssshhh! Don't tell anyone! My hubby isn't a big fan of chocolate so he always requests that I only put a few chocolate chip's in them (like I need to be reminded every single time, it's been almost 15 years that we have been married). One time, I made him his own batch with one chip per cookie. I love him! Preheat the oven to 325 degrees F (165 degrees C). Grease cookie sheets or line with parchment paper. Sift together the flour, baking soda and salt; set aside. Mix in the sifted ingredients until just blended. Stir in the chocolate chips by hand using a wooden spoon. 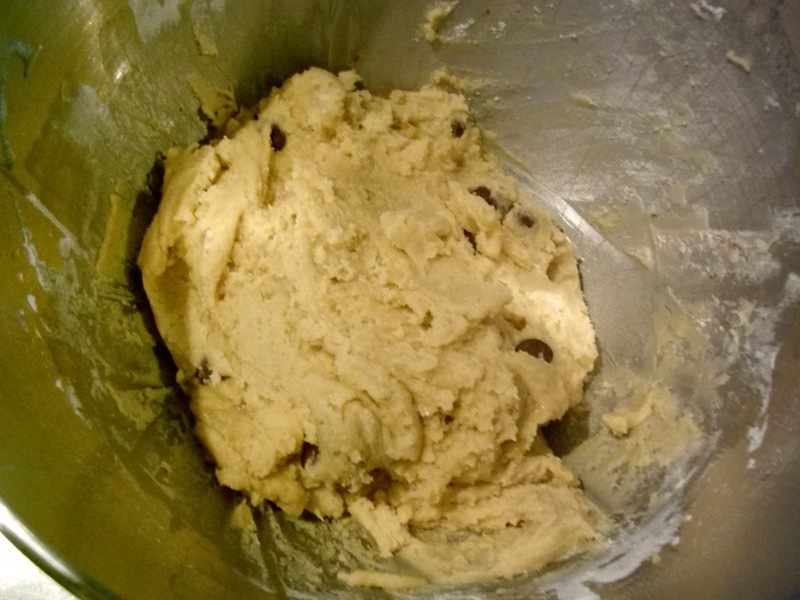 Resist the urge to eat the dough, keep going! 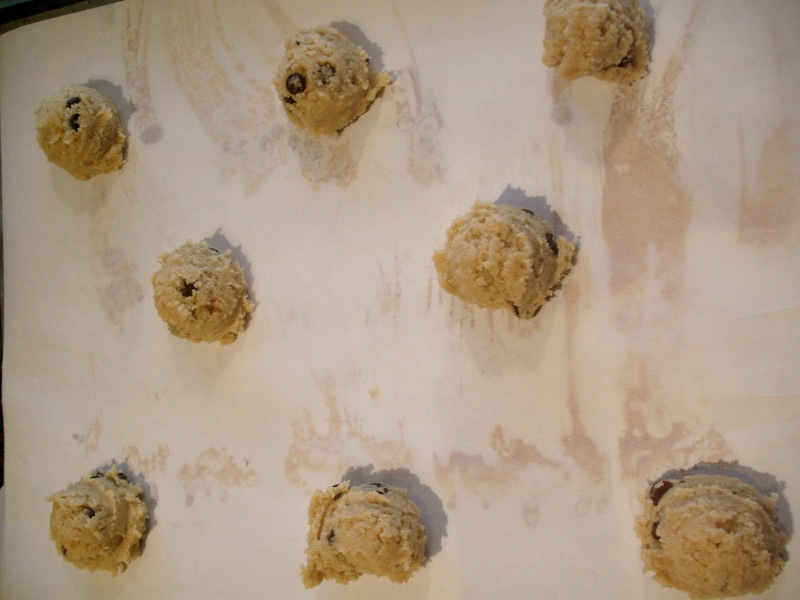 Drop cookie dough 1/4 cup at a time (I use an ice cream scoop) onto the prepared cookie sheets. Cookies should be about 3 inches apart. Don't eat them yet, put them in the oven! I reminded him, "Honey, you can't eat these cookies for breakfast, lunch and dinner!" To which he replied, "I can if you make enough!" Did I mention how much I love him! one chip per cookie sounds PERFECT. 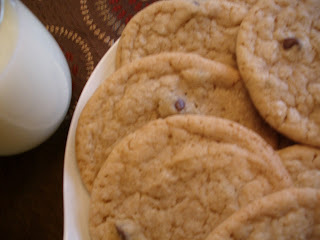 i think i'll be making these cookies soon, they look SO good. i like chocolate but in serious moderation. plus these just look so darn good! Thanks Aleasa! The ONE cookie he allowed me to have was scrumptious ;) He ate the last one yesterday, good thing I'm heading home tomorrow! Love your space. Happy to follow you. Hello! You could anything you wish. Cinnamon chips, white chocolate chips, dried cranberries, any variety of nut. The possibilities are endless! 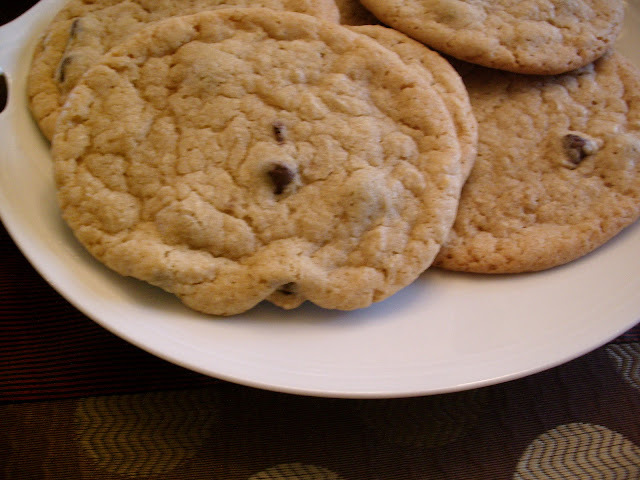 What should I use INSTEAD of chocolate chips?